Source code management (called source control in Developer Studio), provides version control for your individual and multi user application resources, allowing multiple users to work on the same files. A source control product manages access to source code and keeps track of all code changes. Developer Studio provides access to basic source control functions through menu options in the Developer Studio Explorer, which is the Developer Studio user interface for accessing files. If your site has installed a supported source control product, you can track the history of project code without leaving your development environment. Source control is available from the Projects area in the Developer Studio Explorer, when performing local, stand-alone development, or remote project development against a central WebFOCUS repository. This feature is also available when working from the Managed Reporting area of Developer Studio. The WebFOCUS Developer Studio Source Control feature uses the Source Code Control API (SCC API) that is utilized by the most popular Version Control Systems (VCS) on the market. The SCC API is an industry standard specification for Version Control Systems (VCS) connectivity defined by Microsoft. The client software for the Version Control System (VCS) that is used must be installed on the computer where Developer Studio is installed. The Version Control System (VCS) database can reside anywhere on the network and on any platform. The required client software can be installed after the Developer Studio installation. Multiple Version Control System (VCS) client software can be installed and the developer can select the provider they want to use. From the Developer Studio main menu, select Window and then Options. When the Developer Studio Options dialog box opens, click the Source Control tab. Select the required system based on the detected Source Control Systems. When you start Developer Studio, it checks your system to determine if a supported source control product is installed. If Developer Studio detects a supported product, it enables optional use of that product for the management of Developer Studio application resources. In the Developer Studio Explorer, select Options from the Window menu. From the Developer Studio Options dialog box, select the Source Control tab. The source control system or systems detected by Developer Studio during startup are listed. Note: If no systems are detected this tab indicates that no Source Control providers are available. If more than one system is listed, check the one you want to use, and click OK. Otherwise, Developer Studio will use the system that is listed and checked by default. Note: If you do not want to use the Source Control feature, uncheck the selected system. Click Cancel to close the dialog box and return to Developer Studio Explorer. You can implement source control on a Project or in the Managed Reporting area while selecting a folder or file under the top level Content folder. Developer Studio writes information regarding source control in the .gfa file of the project when you select the option Add to Source Control. For Managed Reporting, information is stored in the WebFOCUS database. The following information pertains to using Source Control from the Projects area. For more information on using source control from the Managed Reporting environment, see How to Use Source Control From Managed Reporting. Depending on the way you access a source control option, that option is applied to a Developer Studio project (GFA), or to a single file or multiple files, if selected. A project refers to an entire folder with all its contents (files). If an object is selected (for example, a project or file), a source control option is applied to that object. Click the Source Control button on the toolbar. Select Source Control from the menu bar. Select and right-click Projects on localhost, (or the WebFOCUS environment name that you are using), and select Source Control from the context menu. Select and right-click a project in the Projects area, and then select Source Control from the context menu. Select and right-click a virtual folder under a project, and then select Source Control from the context menu. Select and right-click a file in a virtual folder, and then select Source Control from the context menu. From the Managed Reporting area of Developer Studio, shown as Content in the explorer tree, you can add folders to the Version Control System (VCS) database by creating a new project for the selected folder. Note: The examples and images in this procedure use Microsoft Visual SourceSafe. The connection process and creation of the project on the Version Control System (VCS) database vary by product. Select specific files from a Managed Reporting folder, or select a folder to add all files for that folder to the Version Control System (VCS) database. Click the Source Control icon in the toolbar, then click Add to Source Control. Individual files or folders can be added using the right-click context menu. You are prompted to connect to the Version Control System (VCS) database, as shown in the following image. In the Username field, type a valid user name for the Version Control System (VCS) database. In the Password field, type a valid password for the Version Control System (VCS) database. In the Database field, type the full path of the Version Control System (VCS) database. You can also click Browse to navigate to the location of the Version Control System (VCS) database. Once authentication is successful, the Add to SourceSafe Project window opens, as shown in the following image. Select the project directory and the project name. For project name, it is recommended that you use the name provided by Developer Studio to avoid mapping issues between the Managed Reporting folder name and the Version Control System (VCS) project. It also helps developers match and identify the projects. Create the project at the root of the database. To do this, select the root of the tree "$/", provide a project name, and click OK.
Optionally, organize projects to have the same structure as in the Object Explorer area of Developer Studio. For example, when the root of the tree is selected, you can type WebFOCUS Environments, click Create, select the WebFOCUS Environments folder, and type a new name in the project field for the Environment name before clicking Create. This creates a subfolder under WebFOCUS Environments with the name you typed. Select the Environment name, type the project name for the folder, and click OK. If this is a new project, a message appears asking whether you want to create the project. Click Yes. A window opens that shows the files that will be added to the Version Control System (VCS) project you created, as shown in the following image. The files and their Source Control status are visible in Developer Studio, as shown in the following image. To check out file(s), select the required file(s), right-click the selection, and select Check Out. A window with the files requested opens, as shown in the following image. To check in file(s), select the required file(s), right-click the selection, and select Check In. You can view file properties or perform other tasks available from the Source Control menu. Right-click a file that is added to Source Control. From the context menu, select Source Control and click the required option (for example, Source Control Properties). Files are not secured for updates when accessed outside of Developer Studio. To ensure files are not overwritten, all developers must use Developer Studio as their development tool. The following table describes how Developer Studio uses the icons to indicate the status of a file in regard to source control. The file has been added to source control. The file has been checked out of the source control database for editing. The file has been added to source control. The current Developer Studio project is sharing it with another Developer Studio project that has been added to source control. The file has been checked out of the source control database for editing. The current Developer Studio project is sharing it with another Developer Studio project that has been added to source control. The file is being shared with another Developer Studio project. It has been checked out by the other project. The file has not been added to source control, or has been added and then removed. In the Developer Studio Explorer, select and right-click the file. Select Properties on the context menu. On the General tab on the File Properties dialog box, click the Read-only check box to remove the check mark. In the Developer Studio Explorer, notice that the attribute R (read-only) has been removed from the file. Select and right-click the project. Select Properties on the context menu. On the General tab, in the properties dialog box, click the Read-only check box to remove the check mark. In the Developer Studio Explorer, notice that the attribute R (read-only) has been removed from the project. This section describes the requirements needed in order to use AccuRev as a source control provider. In order to use AccuRev as a source control provider with Developer Studio, you must have installed both the AccuRev plug-in, AccuBridge for Microsoft SCC, and Developer Studio Release 8.0 Version 02 or higher. You can download an AccuRev plug-in from the AccuRev website. Download the AccuRev plug-in file from the AccuRev website. Close all instances of IDEs which support MSCCI APIs, such as Microsoft Visual Studio, Microsoft Access, and Developer Studio. Register the AccuRev.dll and SccAcc.dll. Note: If your machine is using Windows 7 or higher, use the Run as administrator option to open the Command Prompt window. Navigate to the folder where you extracted the .zip file. The two .dll files have been registered. The Switch Source Control Provider dialog box opens. Select AccuRev and click OK to close the Switch Source Control Provider dialog box. The AccuRev source control provider is successfully installed. 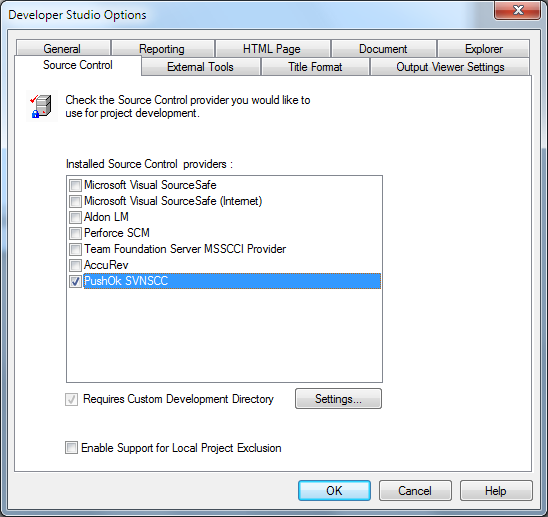 To set AccuRev as the source control provider, navigate to the Source Control tab in the Developer Studio Options dialog box and select AccuRev, as shown in the following image. This section describes the requirements needed in order to use and set Microsoft Team Foundation Server as a source control. Developer Studio 8 and higher supports Microsoft Team Foundation Server as a source control provider. Information Builders has tested and certified Microsoft Team Foundation Server 2012. In order to use Microsoft Team Foundation Server as a source control provider with Developer Studio, you must have the Microsoft Visual Studio® Team Foundation Server 2012 MSSCCI Provider 32-bit plug-in installed. The plug-in is available through the Microsoft website. Windows 7, Windows XP Service Pack 2, Windows Server 2008 R2, or Windows Server 2003 Service Pack 1. Microsoft Visual Studio Team Foundation Server 2005, 2008, 2010, or 2012. Microsoft Visual Studio Team Explorer can also be installed on the same machine as Developer Studio so that you can compare files and perform other tasks such as manage team projects. While in Developer Studio, click Window, and select Options. Select the Source Control tab. Select the Team Foundation Server MSSCCI Provider check box from the list of available Source Controls. Once the Team Foundation Server MSSCCI Provider option is selected, Microsoft Team Foundation Server is used as your source control provider. Note: The Team Foundation Server MSSCCI Provider check box is selected by default if the Microsoft Team Foundation Server is the only source control you have installed. This section describes the relationship between Subversion (SVN) and WebFOCUS applications accessed and created by Developer Studio and provides recommendations regarding the configuration of Subversion and Developer Studio. Subversion does not have native support for the SCC API, however, there are software vendors that provide SCC API plug-ins to allow development tools such as Developer Studio to access the Subversion repositories and use functions that are available from Subversion. The Subversion (SVN) requires that a third-party product (plug-in) is used to provide the SCC Compliance that is used by Developer Studio to connect to the Version Control System (VCS) repository. Note: Although you may use any Subversion plug-in as your Source Control, this section is specific to PushOk SVN configuration. You will have to setup and configure the PushOk SVN plug-in and specify the PushOk SVN Proxy properties. Install the PushOk SVN plug-in. From the start menu, select SVNSCC from the PushOk Software menu. Select Configure plugin from the SVNSCC submenu, as shown in the following image. The PushOk Subversion (SVN) Proxy properties dialog box appears. When you start the Subversion (SVN) Configuration tool, the PushOk SVN Proxy properties dialog box appears. Use the configuration tabs to set the recommended Subversion user options. The SVN executables tab enables you to set tools used by the SVN SCC API to expose standard functionality such as running differences, repository viewers, O/S integration tools, and so on. Type or select an SVN GUI viewer application in the GUI executable field. Since the PushOk SVN SCC client does not provide its own stand-alone viewer, you can specify a viewer by passing it to the current connection string. This is necessary in the case that you would want to use a GUI application instead of the command line to query the SVN repository. Note: If before installing the plug-in you have TortoiseSVN installed on your machine, PushOk SVN SCC plug-in installer will detect it and populate this field for you. PushOk SVN offers the possibility to use its internal comparison tool by selecting the SVN conflict editor (built-in) option in the Diff/merge box. You may also specify an external tool from this field. Select the Conflicts resolving tool. When checking in a file and the conflicts cannot be resolved, a resolving visual tool is shown as set here. This can be provided by PushOk SVN or it can be provided externally. Select a file viewer tool from the Viewing field. The following image is an example of the SVN executables tab on the PushOk SVN Proxy properties dialog box. The SVN options tab enables you to specify how files are treated by Subversion and how the status of these files are reported. Note: It is recommended to set the following SVN options, as they appear in the image below, in order to avoid conflicts. The Known lists tab enables you to administer the SVN connection strings to be used by the PushOk SVNSCC client, and to add or remove SVN modules (directories under the SVN repository) and tags. Select Known Roots from the Select list type drop-down list. Type the SVN string value in the input field under the List section. The string is added to the List section box. The following image is an example of the Known lists tab on the PushOk SVN Proxy properties dialog box. This section describes the relationship between CVS and WebFOCUS applications accessed and created by Developer Studio and provides recommendations regarding the configuration of CVS and Developer Studio. The CVS requires that a third-party product (plug-in) is used to provide the SCC Compliance that is used by Developer Studio to connect to the Version Control System (VCS) repository. Note: Although you may use any CVS plug-in, this section is specific to a product provided by PushOk. You will have to setup and configure the PushOk CVS Plug-in and specify the PushOk CVS Proxy properties. Install the PushOk CVSSCC NT plug-in. From the start menu, select CVSSCC NT from the PushOk Software menu. Select Configure plugin from the CVSSCC NT submenu. The PushOk CVS Proxy properties dialog box appears. When you start the CVS Configuration tool, the PushOk CVS Proxy properties dialog box appears. Use the configuration tabs to set the recommended CVS user options. The Files Types tab enables you to specify how different file types are treated, as shown in the following image. To enforce a certain behavior for a certain file type, enter the extension in the appropriate column to add or remove text files, binary files, or unicode files. The CVS executables tab enables you to specify custom applications to be used with the plug-in. It is recommended to leave the use specified option unchecked so that PushOk CVS acts as the CVS client. This allows for more functionality than the regular freeware CVS client. Type or select a CVS GUI viewer application in the GUI executable field. This is necessary when you want to use a GUI application instead of the command line to query the CVS repository. Note: PushOk CVS does not come with a built-in CVS GUI interface. Note: PushOk CVS comes with a built-in Diff/merge tool, however, it sometimes behaves unexpectedly. Note: PushOk CVS provides a built-in file viewer but you may also specify a custom tool. The following image is an example of the CVS executables tab on the PushOk CVS Proxy properties dialog box. The CVS options tab enables you to specify how files are treated by CVS and how the status of these files are reported. Note: It is recommended to set the following CVS options, as they appear in the image below, in order to avoid conflicts. The Known lists tab enables you to administer the CVSROOT strings to be used by the PushOk CVSSCC client, and to add or remove CVS modules (directories under the CVS repository) and tags. Type the CVSROOT string in the input field under the List section. Note: Repeat this step for adding multiple strings. Select the string that you want to use as your default and click Set As Default. The string will be marked with the (Default) suffix and will be used in future operations with your integrated development environment (in this case, Developer Studio). Although most of the projects (modules) will be done from the integrated development environment, PushOk CVS allows you to add new projects. Select Known Modules from the Select list type drop-down list. Type the name of the module in the input field under the List section. This is the relative path to the repository directory. The module is added to the List section box. Note: There is no default module option. The following image is an example of the Known lists tab on the PushOk CVS Proxy properties dialog box. The Server options tab enables you to specify how the connection to the server is being handled. Select a string from the Select CVSROOT drop-down list. Note: It is recommended to select the default string to avoid confusion. If the selected string is not the default, type the desired string and click Default. Select the This server is CVSNT ver >= 2.058 option if the CVS server you intend to connect with is of a version higher or equal to 2.058. If not, leave this option unchecked. The SSH Options are only enabled when using :ext: protocol. The Encryption option is only enabled for protocols which support encryption. For example, sspi. Select the Check filenames on server option if a UNIX machine hosts the CVS server. This will resolve possible conflicts of file name case-sensitivity. The following image is an example of the Server options tab on the PushOk CVS Proxy properties dialog box. This section describes the relationship between ClearCase and WebFOCUS applications accessed and created by Developer Studio and provides recommendations regarding the configuration of ClearCase and Developer Studio. Snapshot Views denote a physical location on a hard drive. Note: Some of the user interface requests are available through the Windows Explorer ClearCase context menu. Dynamic Views are client logical views of a VOB. VOB is a repository for storing versioned projects and metadata. Note: Through Windows Explorer, limited operations are allowed to be performed on the set of exposed files. For instance, a checked in file under ClearCase control cannot be removed using Windows Explorer commands or other Windows API call. The same thing is true for changing the Read-Only flag. Snapshot Views work while disconnected from the network. Views are updated when you perform manual requests. However, this can cause views to become out of date. The file loaded during checkout may not necessarily be the latest version in the VOB. Dynamic Views are always up to date and require that you are connected to the network. If you are not connected, network issues will arise while attempting to use Developer Studio, ClearCase Explorer, or even Windows Explorer, as the Dynamic view will not be loaded. To use the Developer Studio Source Control feature with ClearCase, you must associate the WebFOCUS applications (residing in a local or remote WebFOCUS Environment) to a ClearCase view. Note: Other Source Control systems support the concept of Current Working Directory, which is an ad hoc association of a local directory to a Source Controlled project or directory. In other words, an SCC project or directory could be associated with any physical, reachable location, where all SCC operations will take place. For ClearCase, only the designated view is the one to be recognized by ClearCase as the location (physical or virtual) where the SCC operations could take place. From Developer Studio, applying a Source Code Control operation on a file found on a remote WebFOCUS Environment involves an HTTP copying from the WebFOCUS application to the view directory, or the other way around. Depending on the view type, these operations could also involve modifying file attributes or timestamps. Tip: Since the view is just a file transfer place between the ClearCase system and the WebFOCUS application, some problems arise with the Snapshot Views as files added to the view may be out of date, or may already be checked in by another developer. Given all these limitations, Dynamic Views are recommended. It is recommended to set the following ClearCase user options for easier operation. From the ClearCase Explorer Tools menu, select ClearCase Options from the Options submenu. In the Check In/Add to Source Control section of the Operations tab, select the Use original checkout information and Preserve file modification time options. In the Check Out section of the Operations tab, select the Preserve file modification time option. Note: Other options can be customized, as necessary. The following image is the ClearCase Explorer with these default options set. The following notes and recommendations should be taken into consideration when using ClearCase as the Source Control. Parallel development (multiple checkouts of the same file) is supported by ClearCase and automatic merge technology is available from ClearCase. Note: ClearCase can handle most merging aspects. There are, however, cases in which conflicts may arise that will require intervention by the developer. To avoid issues that may occur as a result of merging, single stream development is recommended. Developers working with WebFOCUS files and applications must be aware that this behaves like a shared file system. Any modification of a WebFOCUS file could be seen by all other developers using that specific file. Working with the file is taking place at the WebFOCUS location where that file resides. The Source Code Control system just imposes restrictions on accessing that specific file. After ClearCase, CVS, Subversion (SVN), ChangeMan DS, or any other required client software is installed and configured, there are several steps involved in setting up Developer Studio to work with your Source Control provider. You must set the Developer Studio Source Control options and validate and configure the Source Control variable in the WebFOCUS Client Configuration file. For ClearCase, install and configure the ClearCase Client software on the PC where Developer Studio is installed and create the required Dynamic View(s) attached to the VOB you are interested in. Note: The drive assigned to a view does not need to be the same for all developers, and more than one view can be created. For CVS, Subversion (SVN), and ChangeMan DS, install and configure the client software or the required plug-in, as described in the CVS and Subversion sections. For details, see Using CVS as the Source Control Product and Using Subversion (SVN) as the Source Control Product. When Developer Studio starts, it checks to see if any supported Version Control Systems are available. If supported systems are detected, they will be visible in the Developer Studio Options dialog box, in the Source Control tab. The product will activate Source Control commands in the main menu, context menu, toolbar, and the Developer Studio Explorer. The following image is an example of the Developer Studio Options dialog box with the Source Control tab selected. The PushOK source control is selected. Note: If more than one version control system is detected, you must specify which version control system to use. Select the Requires Custom Development Directory option to enable the Settings button. The SCC Development Folders dialog box appears. Note: There may be a delay before the next dialog box is shown. From the SCC Development Folder dialog box, type or select a directory in the Default Development Directory field. Note when using ClearCase: This directory should be an existing directory inside a Dynamic view. To avoid errors, it is recommended that you browse to select the development directory. The directory specified in the Development Directory will be used as the root directory for all ClearCase local operations. Note when using CVS: This is the directory where all CVS file transfers will take place before or after the CVS actions files can be copied to or from their real location in this directory. Note when using Subversion (SVN): This is the directory where Subversion (SVN) will store the files specified in the Source Control Directory. By default, the value is the directory specified in the Default Development Directory. Note when using ChangeMan DS: This is usually a directory on the local PC where the development work takes place and it is used to store files that are checked in and out of the version control systems repository. The following image is an example of the SCC Development Folders dialog box with the Default Development Folders Directory selected. Click OK to save and close the SCC Development Folders dialog box. After setting the Developer Studio Source Control Options, a validation message appears, as shown in the following image. Version Control products that require a Development Directory (for example, ClearCase, CVS, Subversion, ChangeMan) need to also have a Source Control variable set in the WebFOCUS Client of the WebFOCUS Environment that is used for development. This variable, SCC_NAME, is used by the WebFOCUS Developer Studio Source Control feature to identify the development environment. The variable is usually set to the name of the machine (it should be different than the SCC_NAME of all other systems that contribute files to the Source Control repository). An example of using the machine host name would be SCC_NAME=dev-server-1. / \ " ' ? : * < > | . Note: Avoid changing the value once files have been added to the Source Control repository. If you need to change the value, either all files will have to be added to the repository again, or the repository will need to be changed to be consistent with the new value. This is because the SCC_NAME value is used to establish the file identity in the repository. Changing the value will require that all files are added to the repository again or that the repository be changed to be consistent with the new value. You may set the Source Control variable from the WebFOCUS Administration Console or by manually adding it to the WebFOCUS Client configuration file. From the WebFOCUS Administration Console, click General under the Configuration section. Identify the development environment for the Source Control in the SCC_NAME field. Note: By default, there is no value set for this field. Provide a name for the SCC_Name variable. Click Save to save the Client Settings. The following image is an example of the WebFOCUS Administration Console showing the SCC_NAME Field. Note: If the unique identity of the environment cannot not be established based on the SCC_NAME, then the HTML Alias can be used as an alternative. The HTML Alias is also useful when more than one WebFOCUS environment is set up on the same server. This enables you to specify which WebFOCUS Environment is to be used. For all other cases, HTML Alias does not need to be altered. This topic describes the source control options available from Developer Studio. Note: These options depend on the Version Control System (VCS) utilized. Select this option to view a file without changing it. This option retrieves the latest version of the selected file and provides you with a read-only copy. If you attempt to make changes, they are not saved. To make changes to a file in source control, you must first check it out of the database. The Check Out option retrieves the latest version of the selected file and allows you to edit it. Source control removes the attribute R (read-only) from a checked out file. A file that has been checked out displays the description Checked Out in the Developer Studio Explorer. Select this option to return a checked out file to the source control database. Source control stores any changes made to the file in the database. Select this option to reverse a check out and cancel any changes made to a file in your working area. Before you can add Developer Studio files to source control, you must have a source control project in which to place them. Therefore, to implement source control, the first option that you will usually choose is Add to Source Control. When you add a Developer Studio project (GFA) to Microsoft Visual SourceSafe for example, SourceSafe creates a corresponding project (folder) in which to store the files that get sourced, using the same name as the Developer Studio project. A project refers to an entire folder with all its contents (files). A file added to source control displays the description Controlled in the Developer Studio Explorer. In this example, the HTML files have been added to source control. Select this option to remove a file from the source control database. A file that has been removed from the database, or one that has not been added to the database, displays the description Not Controlled in the Developer Studio Explorer. Select this option to view information about a file, such as version history, date of creation or modification, and other details. Select this option to display the differences between a local copy of a file and the copy stored in the database. Select this option to view or edit certain file properties. For example, you can view the checkout status (including the user, date of checkout, and version), comments, and other file properties. Select this option when you are working in a Developer Studio project and wish to use files from a different Developer Studio project that has been added to the source control database. A file that is shared with another project displays the description Controlled & Shared or Checked Out & Shared in the Developer Studio Explorer. A shared file that is checked out by one project displays the description Exclusive Checked Out & Shared in the other project. Select this option to refresh the display of file status in the Developer Studio Explorer. Click the Source Control button on the toolbar and select Source Control from the drop-down menu. Select Source Control on the menu bar and select Source Control from the drop-down menu. Select this option to disassociate a Developer Studio project from source control. Developer Studio removes the information regarding source control from the .gfa file of the project (it added the information when you selected Add to Source Control). This feature is available from the Source Control option on the menu bar or the Source Control menu when you select and right-click Projects on localhost. Select this option to create a local Developer Studio project (GFA) based on a project in the source control database. It enables a developer to get a project that has already been created and added to source control by another developer. It is available from the Source Control option on the menu bar or the Source Control menu when you select and right-click Projects on localhost. When you add a Developer Studio project to Microsoft Visual SourceSafe, that project is assigned to a corresponding SourceSafe project. If one Developer Studio project shares files from a second Developer Studio project, you must also add the second project to SourceSafe. For example, if a Developer Studio project named Sales uses files from baseapp, you must add the baseapp project to SourceSafe. If you do not, the shared files cannot be managed by source control. When you add files to Visual SourceSafe, SourceSafe assigns the attribute read-only (R) to them. When you check out a file, SourceSafe removes the read-only attribute to allow edits to the file. When you remove files from SourceSafe, SourceSafe retains the read-only attribute originally assigned. You must manually change the attribute to restore write access. For more information, see How to Restore Write Access to a Single File and How to Restore Write Access to a Project for instructions. To use source control effectively, you must be familiar with the specific source control product that you have and its database structure. Your source control administrator can give you information on the setup at your site.